Librarian Karen Nash has returned to London with B & B owner Caldwell Perkins to pursue both their relationship but also the feasibility of opening a bookstore. They are barely back when Caldwell’s old girlfriend and business partner, Sally, shows up with her new boyfriend, Alfredo. She left him in the lurch 7 years ago and after all this time she wants to reclaim her half of the business or have Caldwell buy her out. She seems to have forgotten emptying their bank account and leaving him on his own to run the Bed & Breakfast all these years. That night Karen is jolted out of bed by a loud crash. She rushes into the hallway to find Caldwell standing there in the doorway of the library with a horrific look on his face. Karen peers in the door and all she can see is one of the huge bookcases has toppled. That’s when she notices a woman’s hand under the enormous pile of books. She soon realizes it is Sally and that she is dead. This has to have been an accident, right? The detective thinks it was murder and Caldwell is his prime suspect. Karen is determined to find the real culprit that caused this bump in the night because she knows Caldwell is definitely not going to be booked for this murder. In this followup to Killer Librarian, we find Karen back in London. I admit I wish the characters would have spent a little more time in Minnesota but hopefully they will in a future installment. The main characters continue to emerge and there is the expected twist in this genre. The story does flow nicely. It was a fun read but it was just missing that little something. Karen is a very intelligent woman and her relationship with Caldwell just seems a little whirlwind for me. She just came across very pragmatic in the first book. It was her first trip abroad and she was reeling from her broken relationship. I realize she is in her 40’s and the start of the romance between her and Caldwell was a large part of the first book but they are already so familiar with each other and making huge future plans. I just feel like we missed out on the courtship building between them. They haven’t even had much of a disagreement on anything. I hope the author slows things down and adds a little real life conflict that happens in all relationships as I am sure they will be working together to not only open a bookstore but solve another mystery or two or many. The author has a handle on the mystery aspects. There is plenty of room for character growth and development in this new series. I will be watching for book 3. 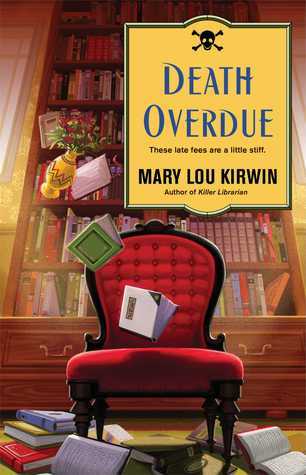 Mary Lou Kirwin has lived in France, Belgium, England, and New York City. She now lives a quiet life in the wilds of Minnesota and Wisconsin. She feels she owes a great deal to all the librarians in her life—for handing her the right book at the right time. Find out more about this author here. I have the first one on my t-b-r list. Ooh, another library/bookstore mystery? This is going on my TBR list.